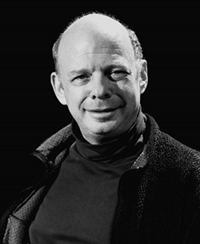 “I’ve done some things, and some of you may have come for some of them.” With that, Wallace Shawn – whose program bio mentioned neither My Dinner with Andre nor The Princess Bride – embarked upon an evening of readings called “Real World, Fake World, Dream World,” presented by UCLA Live at Royce Hall on Saturday, Jan. 22. With no introduction, Shawn delivered a list of facts about the world, crafted into an easy sort of stand-up routine, before he embarked on the first essay. Works by Elizabeth Eisenberg, poet John Ashbery, and Shawn himself followed, and a generally captivated audience responded in kind with the occasional belly laugh and applause. One rather insightful audience member, who reminded me of the Hollywood book club-goer who actually reads and ponders the material before attending, pointed out Shawn’s frequent use of non-human animals in his theater works. With a slow, steady pace that by that point in the evening seemed characteristic of him, Shawn replied that he seeks the universal and the connective element in his work, that whatever divides nations and ideologies can almost certainly be surpassed through the animal qualities we all have in common. Despite the program’s regression into disorganized Q&A, Shawn provided an excellent and informative glimpse of his own ideas, those that influence him, and the many forms a writer can choose to be as dissident as is pleasing. One can only hope that Shawn will give more readings here in the future. Sounds like an evening I would have enjoyed…never knew W.S. was so interesting and intelligent. His roles are more comedic usually…at least the ones i’ve seen.